The cookies are delicious! 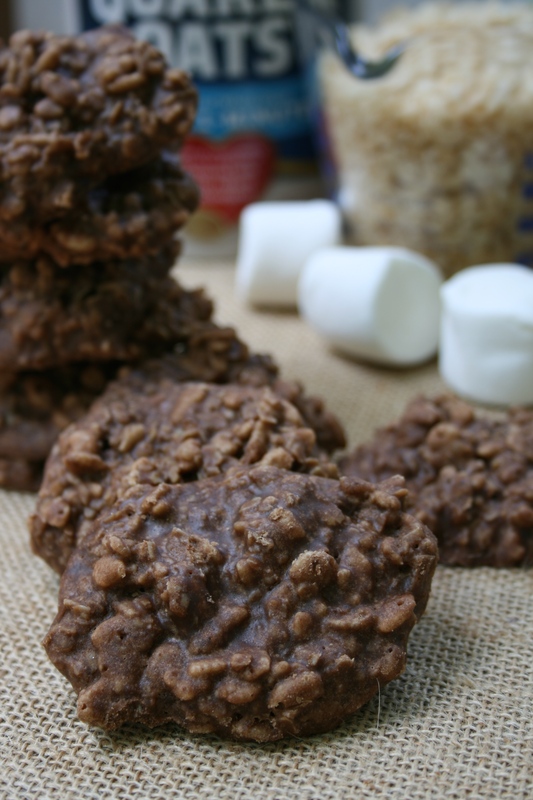 They’re filled with quick oats, marshmallow, rice cereal, and cocoa powder and, best of all, they’re no bake. Perfect for summer! You’ve got to make these! In a saucepan, bring the sugar, cocoa, butter, and milk to a rapid boil for three minutes. Then quickly mix in the vanilla, oats, rice cereal, and marshmallows and drop tablespoons onto a sheet of parchment paper. Let cool and then eat! 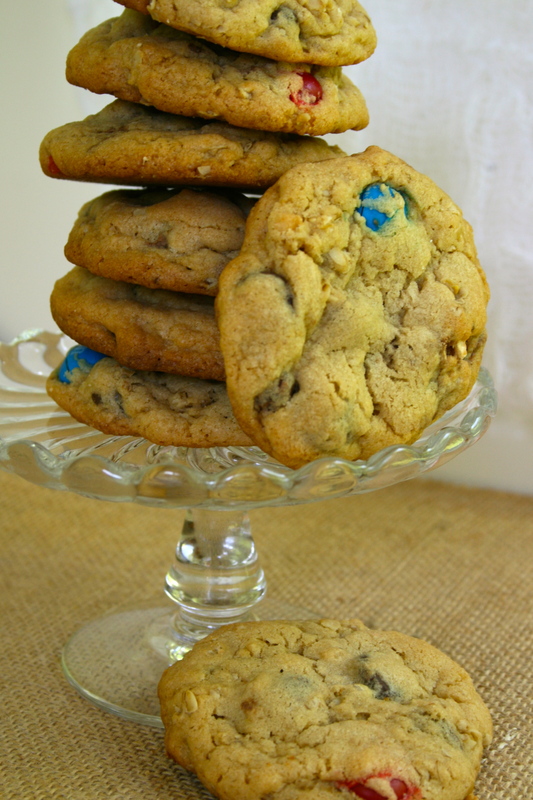 I know, another peanut butter chocolate recipe, but really, is that ever a bad thing? This recipe’s a classic. 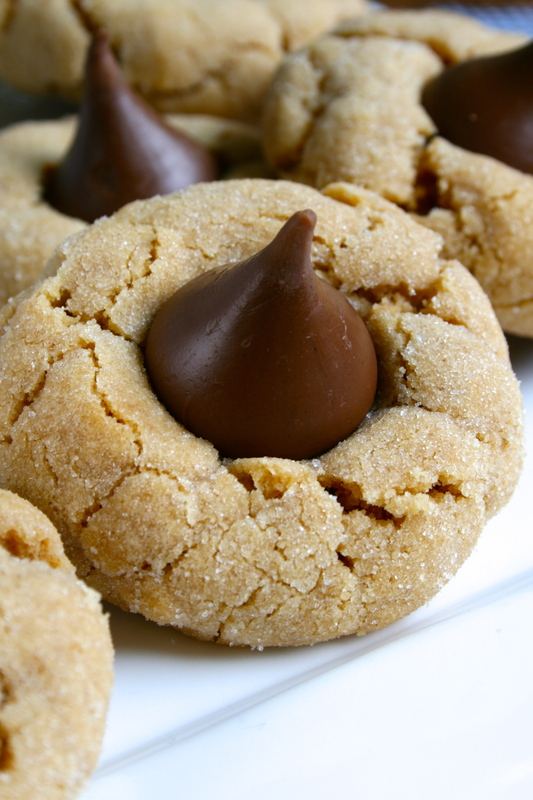 A Hershey Kiss stuck on top of a still hot peanut butter cookie. Yum. Beat shortening and peanut butter together until creamy. Whip in both sugars until lighter in color. In a separate bowl, mix together the flour, baking soda, and salt. Add, in intervals, to the wet batter. Roll cookie dough into 1 inch balls and roll in granulated sugar before setting on an ungreased cookie sheet. Bake for 8-10 minutes, or until lightly browned on the bottom. 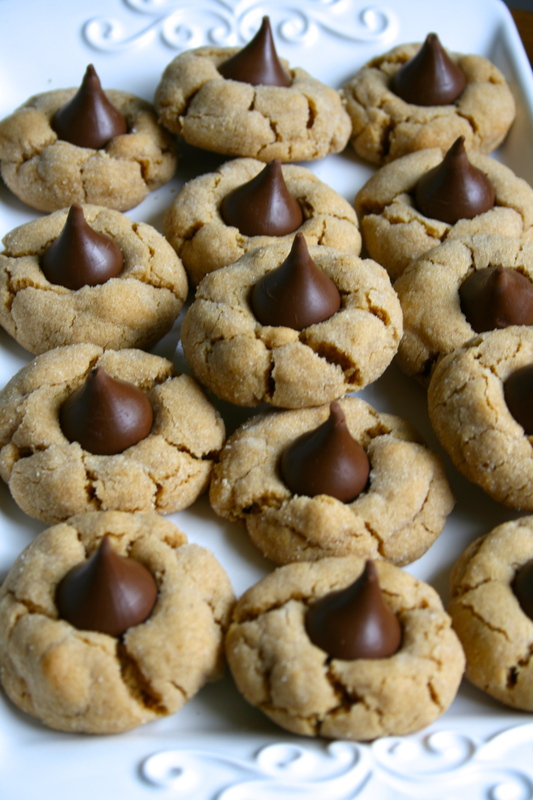 Immediately press kisses into the cookies and cool. 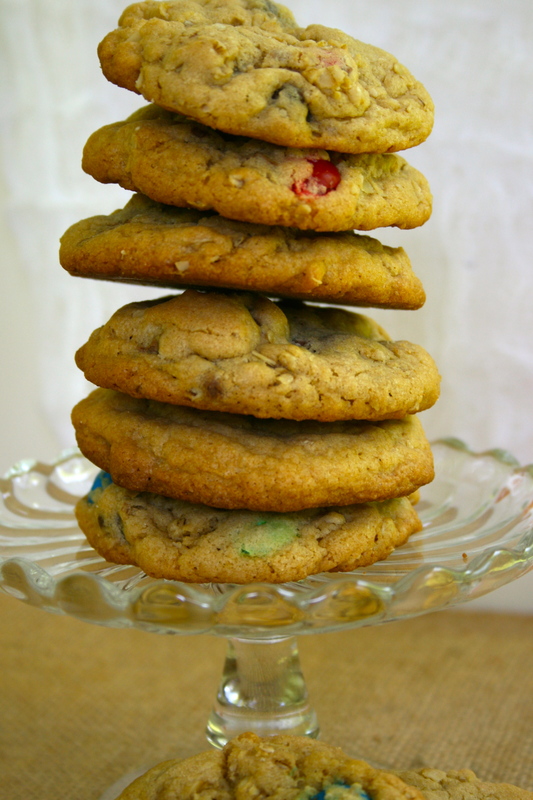 After five minutes, move cookies to a wire rack. Preheat oven to 360° F. Line a standard cupcake pan. In the bowl of electric mixer fitted with the paddle attachment sift together flour, sugar, cocoa powder, baking soda, baking powder, and salt. In a medium bowl or measuring cup, combine the buttermilk, coffee, oil, egg and vanilla. Add liquid mixture to dry ingredients and whisk until smooth, about 1 minute. Divide batter among the liners (about 3/4 full). Bake until a wooden pick inserted into the center of the cupcake comes out with a only a few crumbs, about 18-20 minutes. Let cupcakes cool in pan on a wire rack for 10 minutes, then turn onto rack to cool completely. Cream peanut butter and butter until smooth. When smooth, mix in heavy cream. 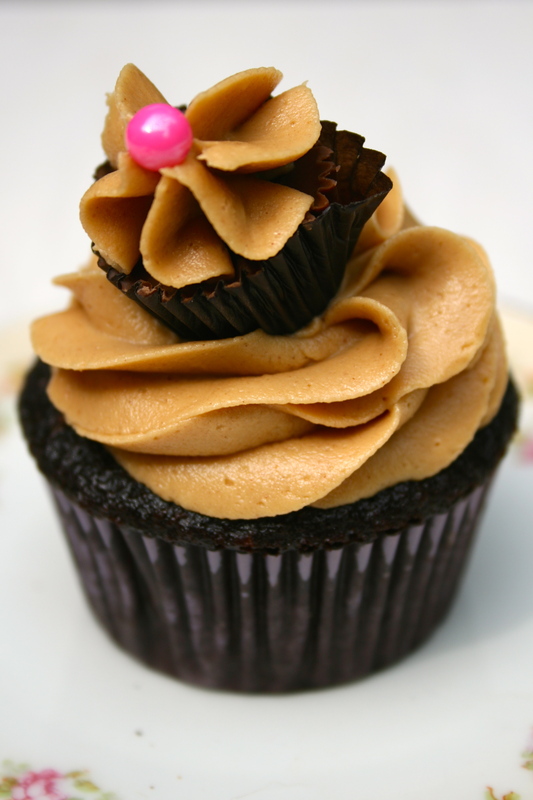 *For the mini cupcakes just pipe frosting onto miniature peanut butter cups. 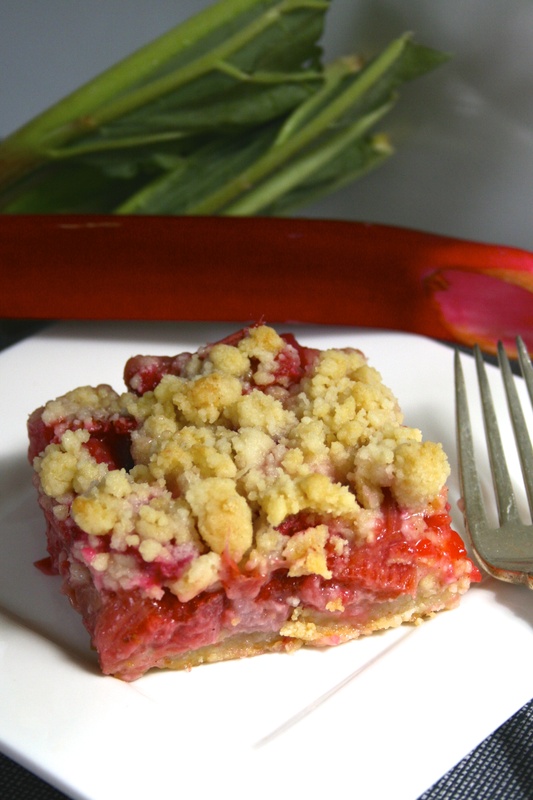 Imagine tangy, bright strawberry rhubarb pie filling sitting on top of a buttery crust and topped with soft vanilla crumble. 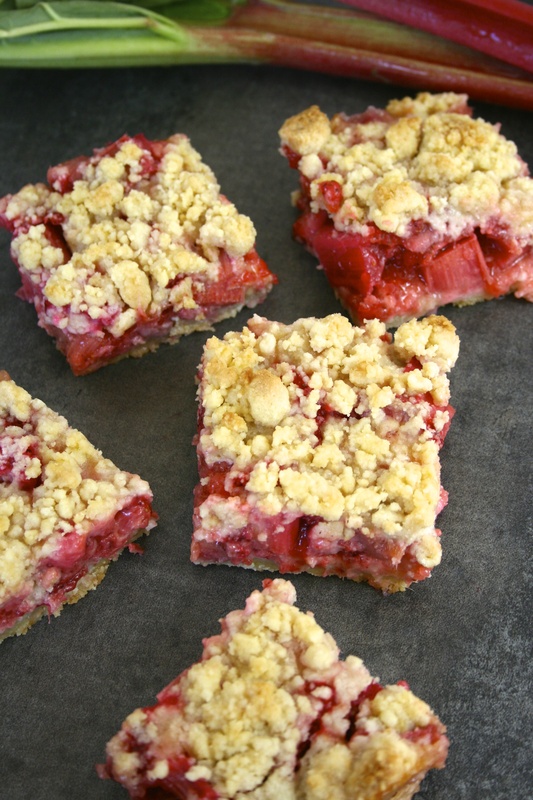 Well you don’t have to imagine anymore, because you can make these gorgeous strawberry rhubarb crumble pie bars! In a large bowl whisk together flour, sugar, baking powder and salt until well combined. Process in your food processor until mixture is crumbly. In a small bowl whisk extracts into beaten egg yolks using a fork. With a fork, gently toss into flour mixture until moistened and dough starts to hold together. Continue to toss and blend gently with fingertips until well combined yet taking care not to overwork the dough. Remove 1 and 1/4 cups of the crumb mixture and set aside for the topping in a small bowl. Press remaining dough evenly into prepared baking pan. Spoon pie filling into pan on top of dough and spread evenly with rubber spatula; sprinkle with reserved crumb mixture. Bake in preheated oven until topping is golden brown and filling is cooked through and bubbly, about 40-45 minutes. Cool completely before cutting into squares. I got this recipe from my Aunt Wendy, who got it from her friend Ilene who lives in England, who adapted the recipe from Sainsbury’s magazine, and I (slightly) adapted the recipe from her. If you are not British and are wondering what a tiffin is, from what I’ve gathered, a tiffin is like a cross between fudge and a rice krispie treat but more crumbly. Kind of. It is really, really, good, and really, really addicting. 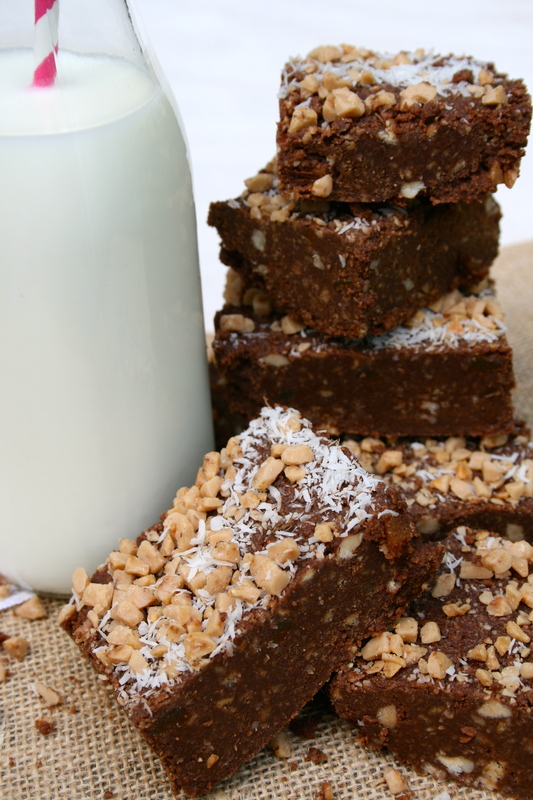 This tiffin is chocolate with dried apricots, coconut, hazelnuts, and toffee bits. Yum! 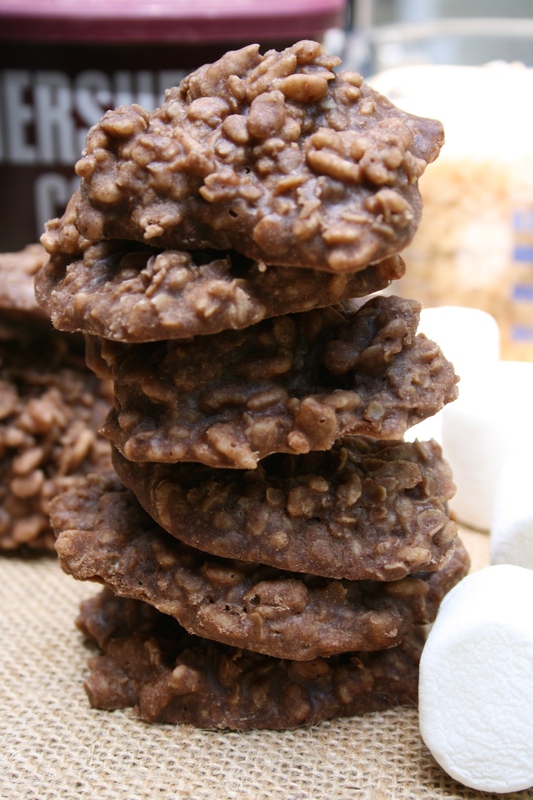 This recipe is also really easy- it’s no bake! Line an 8×8 pan with plastic wrap or parchment paper. Mix butter, golden syrup, and chocolate in a large heatproof bowl. Place bowl over a pot of simmering water. Let it melt together until smooth. In a food processor, process the rich tea biscuits until they’re crumbly. When the chocolate mixture is smooth, take it off heat and combine all the ingredients in the bowl until well mixed. 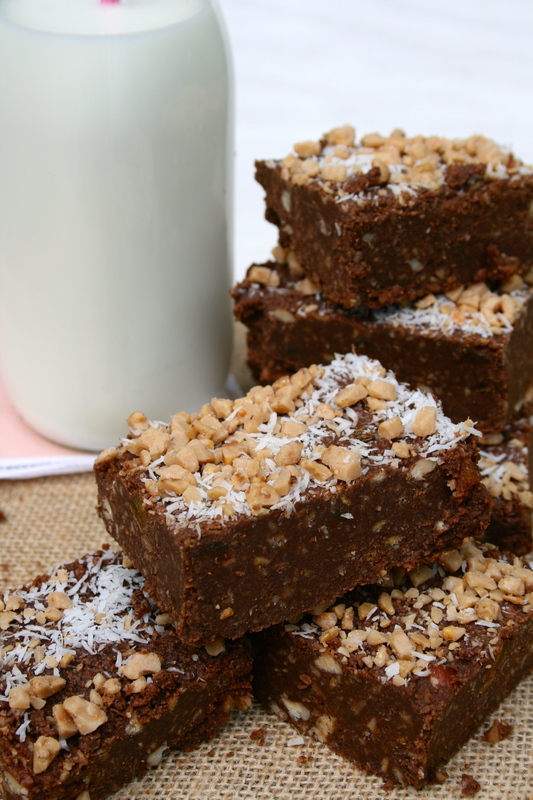 *Sprinkle extra coconut and toffee on top. These are probably the most elegant cupcakes I’ve ever made. 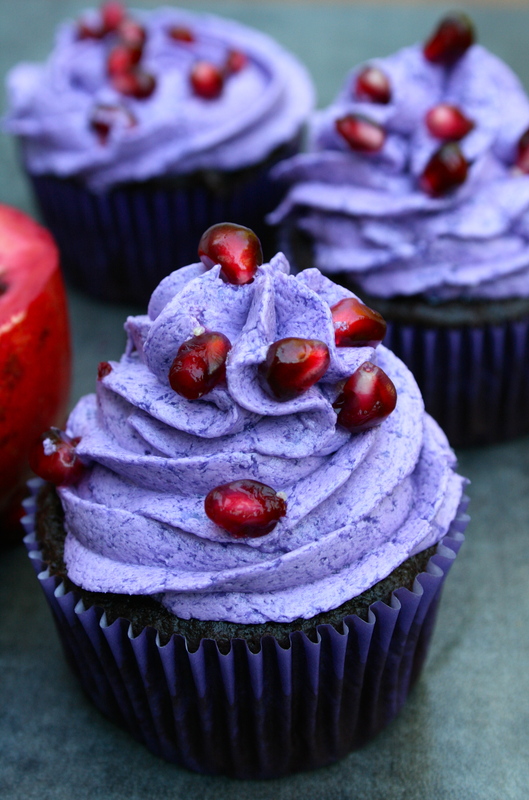 Smooth and silky pomegranate frosting tops fluffy chocolate-pomegranate cupcakes. Yum. 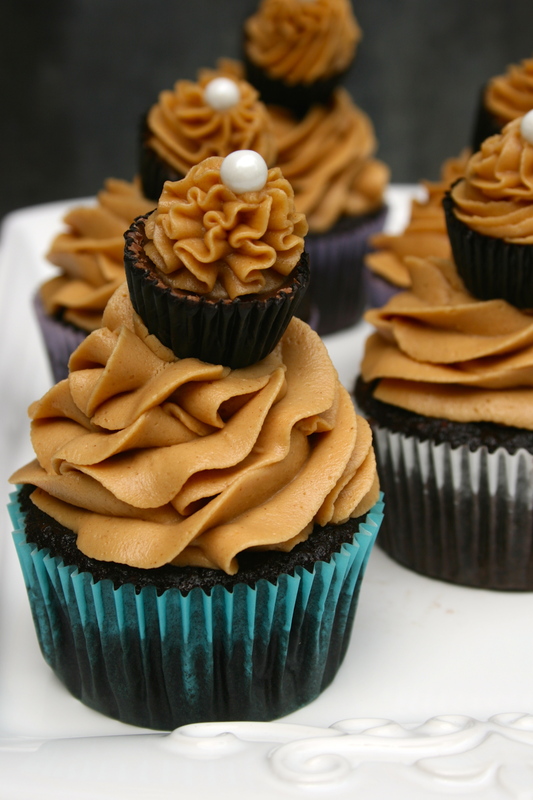 Even if this combination sounds weird at first, you can definitely be assured that these cupcakes are delicious. Preheat oven to 375F and line a muffin tin with cupcake liners. Stir together sugar, flour, baking soda, salt, and cocoa powder. Add the egg, vanilla, butter, and milk on medium-high speed for 2 minutes or until smooth. Fill cupcake liners 2/3 of the way. Bake for 15-18 minutes or until a toothpick comes out clean. Let cool for ten minutes on a wire rack, then take cupcakes out of tray and let finish cooling. In a medium bowl, combine the sugar, flour, cornstarch and salt. Slowly whisk in the milk and pomegranate juice until the mixture is smooth. Place a fine-mesh strainer over a medium saucepan and pour the milk mixture through the strainer into the saucepan. Cook the mixture over medium heat, whisking constantly, until the mixture boils and is thick enough that it starts to become difficult to easily whisk, almost the texture of lemon curd before it sets. This could take anywhere between 5-10 minutes, depending on your stove, heat, etc. It should bubble quite a bit at the end (be careful of the splatters) and thicken considerably. Transfer the mixture to a clean bowl and cool to room temperature – this is extremely important! If it is even slightly warm, the frosting won’t beat up properly. Once the frosting is completely cooled to room temperature (it should have no hint of warmth at all! ), beat the mixture with the vanilla on low speed until it is well combined, about 30 seconds (a stand mixer will work best for this). Add the butter, one piece at a time, and beat the frosting until all the butter has been incorporated fully, about 2 minutes. Increase the speed to medium-high and let the mixer work it’s magic. 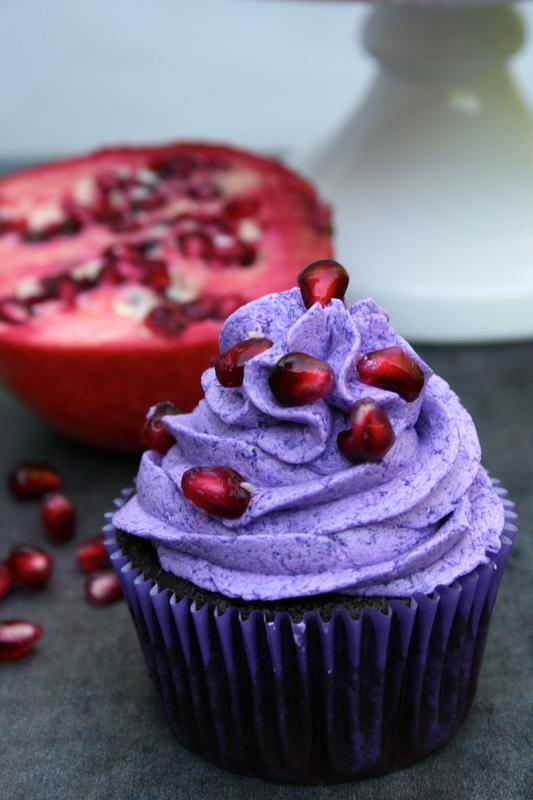 Beat the frosting for five minutes, until it is light and fluffy, then add the tablespoon of pomegranate juice and purple food coloring. This pie is so awesome. 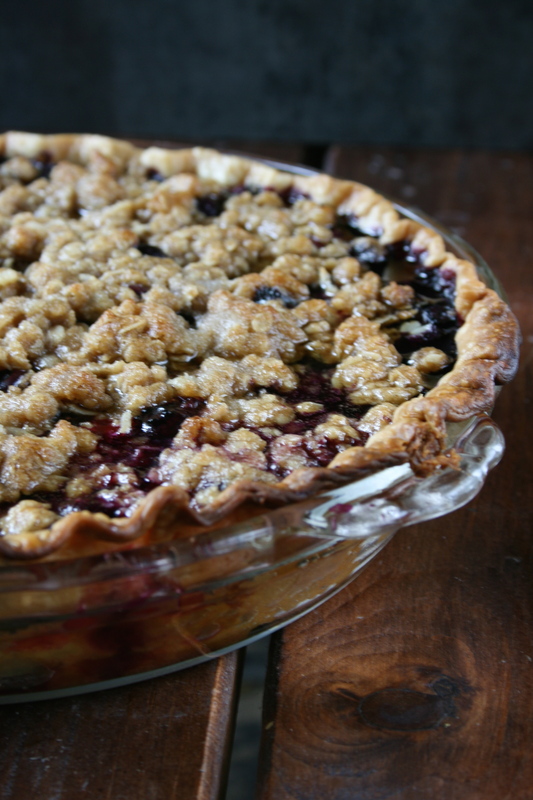 It’s kind of like a thicker blueberry crisp in a pie shell. And the crumble topping? It’s crunchy, cinnamony, and so, so good. Mix together all the ingredients except the butter. With your hands, mix in the chopped butter. Mix all the dry ingredients together (not the butter!) and sprinkle over the blueberries. Line the pie dish with the crust. 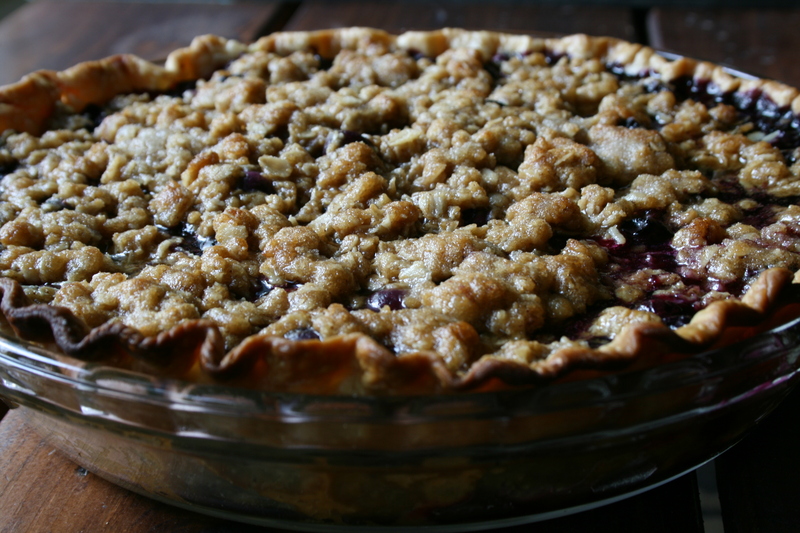 Pour the blueberries into the pie crust and dot with butter. Crumble the crumble topping over the pie and sprinkle the crumble with sugar. Bake until crust is golden brown. Cream butter and sugar until light and fluffy, about 5 minutes. Beat in the eggs, one at a time, and the vanilla extract. In a separate bowl, combine the dry ingredients and add slowly to the wet batter. Mix in all the mix-ins. Shape into 2 tablespoon sized balls. Bake for 10 minutes, or until the edges are lightly browned. Well, I had never made cheesecake before and I wanted to give it a try. I also wanted to make chocolate cheesecake because plain was a little too boring for me. 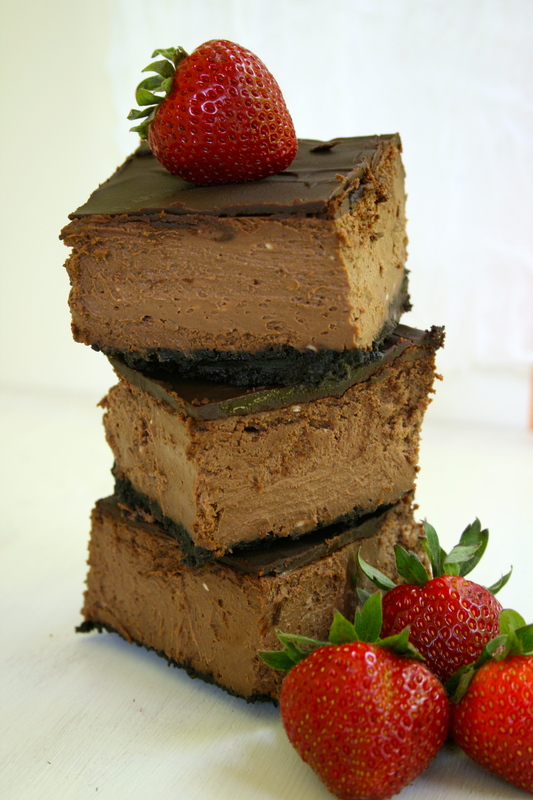 So out popped these amazing chocolate cheesecake bars. They have a crunchy Oreo crust, a creamy, tangy chocolate cheesecake filling, and a smooth top layer of chocolate ganache. Very chocolatey. 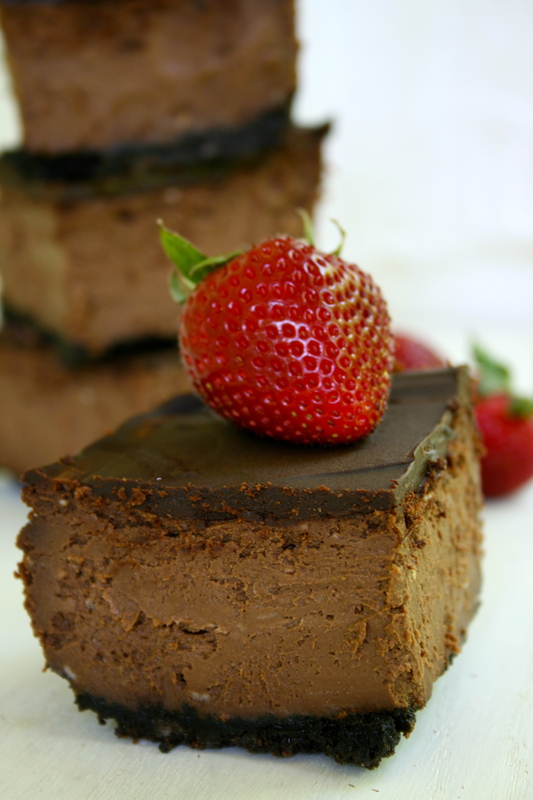 I think these chocolate cheesecake bars turned out beautifully- don’t you? Combine the Oreos and the melted butter in a food processor until it makes coarse crumbs. Press into a 8×8 baking dish and bake for 8 minutes. Melt chocolate over a double boiler and let cool to room temperature. In a large bowl, beat cream cheese until smooth. Mix in the granulated sugar. Beat in each egg until incorporated. Beat in vanilla extract. Fold in the sour cream until the batter is even. Pour batter into pan. Bake for about 50 minutes. The cheesecake should be firm, but the middle should be a little wet and wobbly. Let cool to room temperature and refrigerate at least an hour before spreading the ganache over the top. Put chocolate in a small heat-proof bowl. Bring the heavy cream and butter to a boil and immediately pour over the chocolate. Let stand a few minutes, and then whisk until smooth. Let cool slightly and then spread over the cheesecake with a off-set spatula. Return cheesecake to the refrigerator for several hours, or overnight. Happy friday, guys! 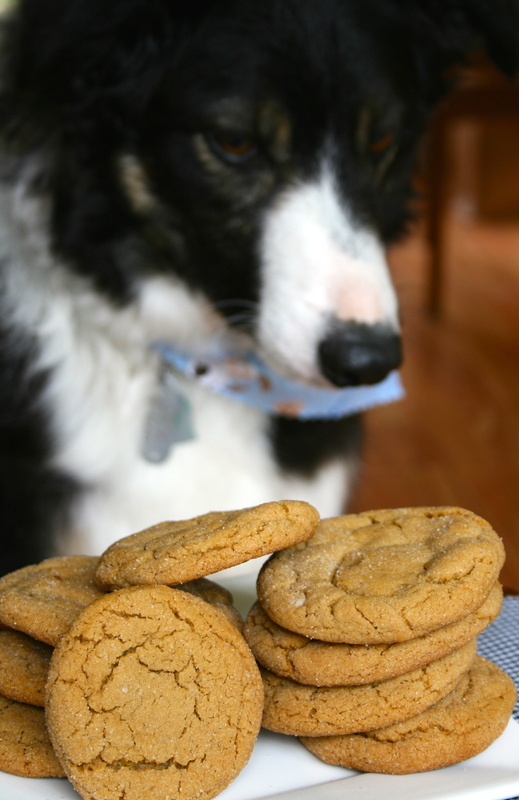 I made you some ginger cookies. 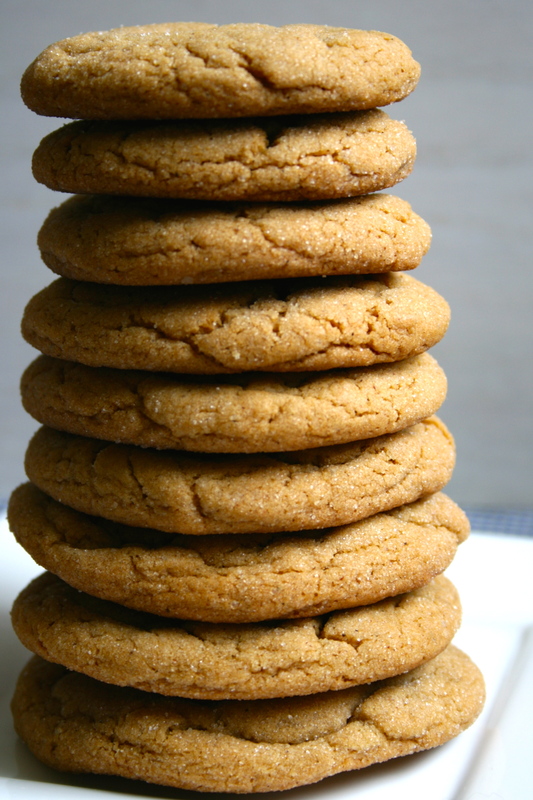 These ginger cookies are soft and full of flavor, they’re also rolled in sugar so the outside has some crunch. In a large bowl, cream the butter and sugar until light and fluffy, about 2 minutes. Beat in the egg and the molasses. In a separate small bowl, whisk together the flour, ginger, baking soda, cinnamon, cloves, and salt. Gradually add to the wet mixture and mix well. Form 1 and 1/2 tablespoon sized balls and roll in sugar. Place 2 inches apart on baking sheets.